After all the diabetes in the wild encounters on our DC trip, I didn't expect to have any more for a while. But I was wrong. A couple weeks ago, I was on a field trip with my class. Across the room, something caught my eye. The unmistakable sight of a pump set on the arm of a little girl. It was a Sure-T or Contact Detach, with the two adhesive circles, making it even easier to spot. As my students were fully engaged in their activities, I worked my way over towards the little girl. She was with another girl, and a woman I assumed to be mom was snapping pictures. Since it worked so well before, I said, "I spy a pump set!" The girl looked up at me and smiled. "I have a pump too!" I said. I was wearing a dress with my pump hidden in my bra, and my set wasn't visible. Of course. I turned to the woman with the camera: "What kind of pump does she have?" "I'm not sure," she said apologetically. "I'm her aunt. She's been diabetic since she was two." I talked to the aunt for a couple more minutes, and then it was time to move on. "It was nice to meet you," I said to the girl. She turned around and smiled again, "It was nice to meet you too." I rejoined the other teacher on the trip with me, and told her about what had just happened. And things went back to normal. Or so I thought. A little bit later, I saw an adorable little girl toddling around. Around her waist, was a sparkly pink thing that looked an awfully lot like a pump pack. But no, it couldn't be. I'd already had one diabetes run-in on this trip. No way there'd be another. But as she toddled by again with her dad, I saw pump tubing sticking out the side of the sparkly pink pack. I couldn't believe it! That made three PWDs in one rather small space. As I stood there watching, trying to decide if/what to say, her dad looked my direction and smiled. I took it as a sign. "Is that an insulin pump?" I asked, before I could chicken out. Sure enough, it was. And dad was perfectly willing to chat. Turned out that sweet little girl was only diagnosed about six weeks ago. And she's already pumping? Dad explained that it was because she needs such tiny amounts of insulin that dosing by syringe was nearly impossible. I was able to supervise my class quite well from where we were standing, so dad and I chatted for quite a while. It was a conversation I won't soon forget. Before leaving, I gave the dad my email address, and suggested he check out some blogs, especially those of D moms and dads. I don't know if I'll ever hear from him, but I'm so glad we met. He and his precious daughter were truly a joy. This happened during the week of FFL. I was pretty bummed about not being there. But meeting those two little girls reminded me again that I am never alone. It was like my own personal FFL in the midst of a workday. Happy in my heart and soul. Just think - both of the adults went home and told someone else about the cute young lady who also wears an insulin pump. And now, they don't feel so alone. I always point out to Q when I see diabetes accoutrements in the wild, especially if it's another omnipod. I'm sure those little girls (and their family members) feel a little less alone. Ou! I see one lady on the bus with tubing sticking out of her pants pocket all the time. I am so nervous to talk to her because maybe she doesn't want to talk about it. But i want a new pump friend! So cool. How wonderful to have TWO encounters in one day! I'm sure those parents (and kids!) were glad to have run into you. I love D encounters in the wild! You must sure have some sharp eagle-eyes! I hardly ever spot diabetes in the wild. In fact, it only happened once (but it was a father-son combo, so maybe it counts as two?). My mom used to have to guess half units in my syringes. I am glad that parents don't have to do that anymore! Love those random PWD sightings! And great that you could help out that new D-dad to connect with others! I am thinking I will add in the wild to the end of all fortune cookies from now on. I'm sure you touched those girls' lives and they are now telling everyone about the kindred stranger they met in DC. You do have an eye for D in the wild. So does my daughter - she can spot a pump from 100 feet away and before I realize it she is off talking to some stranger. There was one sighting at a fast food restaurant. It was an older gentleman - maybe 60s. She starred at him quite a bit while we ate. I'm almost certain he knew he was being watched. I think maybe because it was an older man she didn't feel comfortable approaching him (thats a good thing right?). Still on our way out we had to pass his table. She looked over, made eye contact and then tapped her pump with a smile. He tapped his and smiled back. I think it's great that you aren't shy and strike up conversations with strangers, especially kids. As a parent of pumping kids I love it when an adult with D takes a moment to say hi to my kids. The fact that you shared your contact information is just wonderful and I hope the dad reaches out to you and finds the DOC. What a great story, Jess! And I have to say it again: Love your approach using the "I Spy" phrase... so perfect when it comes to kids and parents. Amazing how these little meetups come when we least expect them, like Kerri's story on the pizza guy the other day. PWDs and CWDs are everywhere, it seems! Thanks for sharing this. I always hope it's a comfort to other people when I can say, "Hey, me too!" 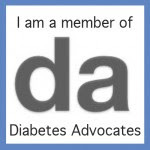 MOST people, in my experience, feel much better knowing they're not alone with diabetes. I have, of course, run across the occasional person who obviously doesn't want to make it known, or anyone else's business. I respect the privacy of those people, but I have to wonder if they'd be happier as a part of a vast network of support. Love it when D-sightings happen! Even better that it was during FFL week...no matter where we are, we can connect! I would totally chicken out! But I have no idea why, when I've been spotted for my pod it's always been pleasant. Awesome stories! I love the DIRLC too, just wish it wasn't so sparsely populated in our neck of the woods. Wait - that doesn't sound right -- I don't want more people to be diagnosed with T1 near us! But, it is so nice to feel less alone. We were recently tapped to be informal mentors for a newly-diagnosed family in our daughter's endo practice and it's nice to feel like some of our experience & online connections might help out others as well. Thanks for your great posts! I always talk to people in the wild. ;) You never know, and if they don't want to talk, it's easy to know that fairly quickly. We have a couple of little ones here on a pump for the same reason... tiny amounts of insulin. I love hearing about "in-the-wild" encounters. Sometimes a random "in the wild" sighting is the perfect pickmeup. "In-the-wild" D encounters are so amazing - And I have no doubt that those 2 little girls will NEVER forget you & I KNOW that you made their day! I love hearing stories like this since I never seem to bump into other PWD! I think it's always exciting to see pumps in the wild, even if I don't get up the nerve to say anything. I guess I'm just a pump nerd, and glad you were able to connect with them! I hope that it was as exciting for them to connect with you too! I also missed CWD. Having been once, as an adult with T1, I know exactly how much fun and learning and connecting I missed along the way. It's great that you got a chance to connect yourself. As a T1 adult I like to think we're sending a message, especially to parents of CWDs, that we're doing OK and their child will do at least as well as us. Dropped by to say happy #dblogcheck day. and love the 2nd girl's endo for not just leaving her high until she could use an easily measurable dose! Great story... Love how even if you didn't get to go to FFL, FFL came to you! I love this post!! It's always great to approach another person who looks to have T1 and respectfully reach out! Having spontaneous support in the form of random meetings is awesome :) thanks for the post!